Fashion's Sense: Instagram Makeup Is Not Everyday Makeup. Deal With It. Instagram Makeup Is Not Everyday Makeup. Deal With It. I know it is #TeaTuesday but I don't have any new tea right now. 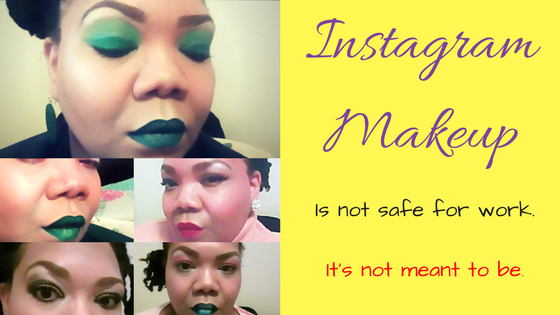 So, I will talk about something you might have heard of, Instagram Makeup or Instagram Beat. No, Instagram did not launch its own makeup line -- that would be kind of cool, kind of funny at the same time -- but Instagram Makeup refers to flawless, layers of product, not practical everyday makeup. I see a lot of women complaining about the makeup looks they see on Instagram and how they are not very practical. The truth is, these looks are not meant to be practical. They are form of artistic expression for these young women and men to show the world their makeup skills. They know these makeup looks are not work-friendly for a regular 9-to-6 (you know employers don't pay for your lunch breaks) job. They know these makeup looks are not feasible for a basic weekend. These looks are for when you want to be extra. Whether it be a for a date, event, girl's night out, or just to make yourself happy, Instagram Makeup is for those special or extra moments when you do you. Now stop complaining about Instagram Makeup and just appreciate it for what it is. Something pretty or interesting to look at and maybe experiment with.